Crayola Deluxe Red Adult Costume.Includes: Bodysuit and the Hat. Available Size: Mens - Large/XLarge. *Shirt, Pants and Shoes Not Included. Accessories Sold Separately.Crayola Deluxe Adult Male Red comes with Red Crayola Bodysuit and the Hat. It does not include the shirt, pants and the shoes. It comes in size LG/XL.It is officially licenced Crayola Costume. Crayola Silver Dress Adult Costume.Includes: Dress and hat.Available Size: One Size Fits Most Adults. *Shoes Not Included.Having trouble coming up with a costume this year? Look no further! This Crayola Silver Crayon Tank Dress Adult Costume is a chic, simple solution to your Halloween party dilemma. Costume includes a silver Crayola tank dress and fun crayon tip hat. Available in One Size Fits Most Adults. 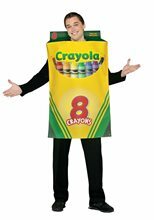 Does not include shoes.This is an officially licensed Crayola costume. 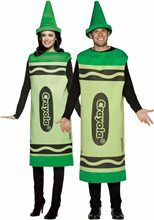 Crayola Deluxe Green Unisex Costume.Includes: One Green Crayon Bodysuit and Hat.Available Size: Unisex - Small/Medium.Material: Polyester.Care Instructions: Spot Clean Only. 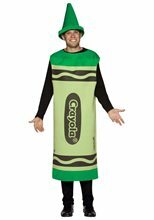 *Shirt, Pants and Shoes Not Included.Crayola Deluxe Green Unisex Costume comes with Green Bodysuit and Hat. It says"Crayola" in the front.It comes in size Small/Medium.Officially Licenced Crayola Costume. Crayola Teen Dress Pink includes body suit and the hat. Crayola Dress Adult Pink Includes the Dress and the Hat.It says "Crayola" in the front. Crayola Blue Toddler Costume.ncludes: Bodysuit and Hat.Available Size: Toddler (18-24 Months).Care Instructions: Spot clean only. *Shoes and Accessories Sold Separately.Crayola Toddler Blue includes the bodysuit and the Hat. It is Available in size 18-24 months. It does not include the black shirt, pants or socks. Care Instructions: Spot clean only. Crayola Red Toddler Costume.Includes: Bodysuit and Hat.Available Size: Infant (18-24 Months). *Shirt, Pants, Shoes and Accessories Sold Separately.Crayola Toddler Red includes the Bodysuit and the hat. It is available in size 18-24 months. It does not include the shirt, pants or shoes.